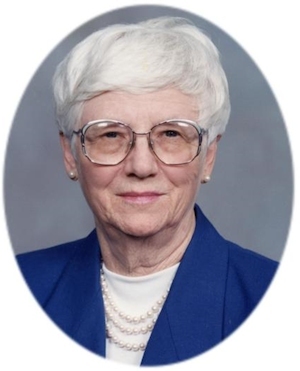 Obituary – Sherwood, Eleanor Margaret (Lovekamp) « Perry High School Alumni Association, Inc.
– daughter of Mr. and Mrs. Frederick Lovekamp, was born July 28, 1918, in Perry, Oklahoma. She has attended school in Pioneer School District 40 and Perry High School. While a student in Perry, she has been a member of the Girl Reserve, Red Hots Club, and Glee Club. She has a seven year perfect attendance record. She is especially interested in business and is planning to attend Business College next year. Eleanor Margaret Sherwood, 92, of Perry, Oklahoma was the daughter of Frederick Charles and Catherine Bamberger Lovekamp. She was born July 28, 1918 in Perry, Oklahoma and died Saturday, August 7, 2010 at Grace Living Center in Stillwater, Oklahoma. Eleanor graduated from Perry High School in 1936. She also attended the Oklahoma School of Business in 1937. She married Gene Moore Sherwood on May 2, 1952 at the First Lutheran Church in Tulsa, Oklahoma. He preceded her in death on December 28, 1959. She retired from Charles Machine Works in 1985 after 15 years of service. Eleanor enjoyed sewing, quilting and cooking for her family. Her greatest joy was her family. She was a member of the Christ Lutheran Church in Perry, Oklahoma. Funeral services will be 2:00 p.m. Wednesday, August 11, 2010 at the Christ Lutheran Church in Perry. Rev. William Metz will officiate. Interment will be in Grace Hill Cemetery. Services are under the direction of BrownDugger Funeral Home in Perry. Memorials may be made to the American Heart Association in care of BrownDugger Funeral Home, 1010 North 7th Street, Perry, Oklahoma 73077. Eleanor is survived by three daughters, Joan Sherwood and her husband, Jay Casey, of Stillwater, Oklahoma, Carol Sherwood of Oklahoma City, Oklahoma, and Anne Sherwood and her husband, William Gattis, of Dallas, Texas three grandchildren, Kathryn Morris and her husband, Sam Scott, Stefan Morris and Zachary Morris and two great grandchildren, Owen Scott and Ellanor Scott. She was preceded in death by her husband, parents, and two sisters, Helene Harrah and Winifred Vculek.